I have this old laptop, Celeron CPU and Windows XP sticker, that I haven’t been able to make myself get rid of. It still works and has a pretty decent display, but it is too slow to be much fun with games and such. Yesterday morning I installed some soft synths on it, and after some tweaking it actually worked. It worked so well that I made a trip to town and bought a cheap MIDI-keyboard to go with it. Lo and behold my minimal couch studio. I haven’t used any soft synths before, and spent all morning installing free ones at random and just doodling. Two that I liked were Minimal and Meteorite from Psychic Modulation, and the doodles resulted in this little clip. Except for Windows itself everything was done with free software. So if you’re curious it shouldn’t be very hard to set up your own stuff. VST Host – It doesn’t make any sounds by itself, but it provides an environment in which the soft synths can run. 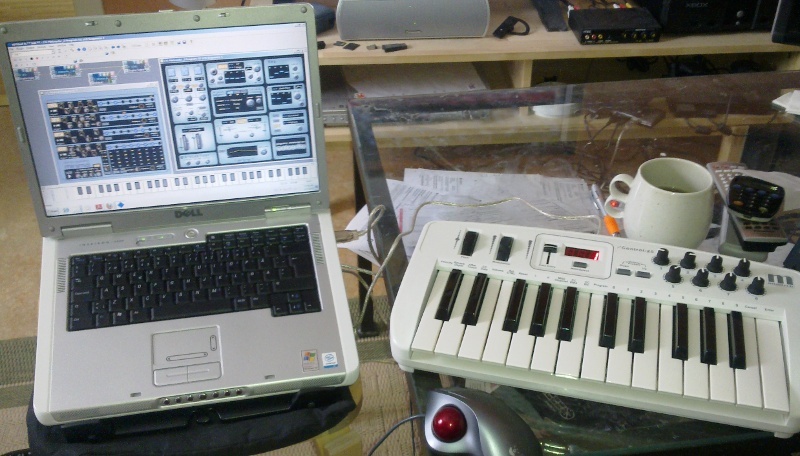 It also allows you to use the computer’s keyboard to play notes, if you don’t have a dedicated MIDI keyboard. ASIO4all – At first I had a noticeable delay from pressing a key and hearing the sound. After installing the ASIO4all sound card driver that problem disappeared, just remember to enable the new driver in VST Host. Psychic Modulation – The site where I got Minimal, the drum machine, and Meteorite, the synth sound. Audacity – I had used this before on Linux, but I installed it on the laptop as well, so I could edit the recording a bit. Miditech I2 Control-25 – The cheap MIDI keyboard, optional really. But I’ve been wanting something like it for a while, and this was a good an excuse to get one as any.